When people ask me if I have any children, I usually smile and respond, "I have eight nieces and nephews, three cats and a dog. Yes, I have children in my life, but I didn't give birth to them." This weekend I need to amend that statement. I have eight nieces and nephews, three cats, one dog and two tiny puppies. The puppies arrived Thursday afternoon, and will move on to their next foster home Monday. 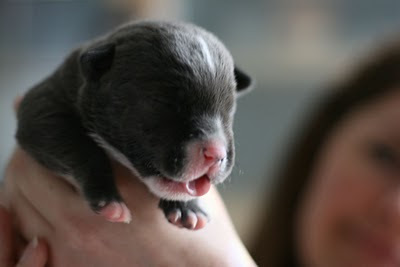 These one-week-old pups were taken away from their aloof doggie-mom at the Town Lake Animal Center. The doggie-mom didn't know what to do with her puppies. She wasn't caring for them properly and, unfortunately, smothered one of her puppies. The caring staff at TLAC noticed the situation, and decided to get the surviving two pups out to a rescue group. One of the awesome foster coordinators with Austin Pets Alive sent an email plea out for these puppies on Thursday morning. Immediately, a foster came forward, but this person couldn't take the puppies until Monday. After some instant-messaging with Chad, we decided to take the pups for the weekend. 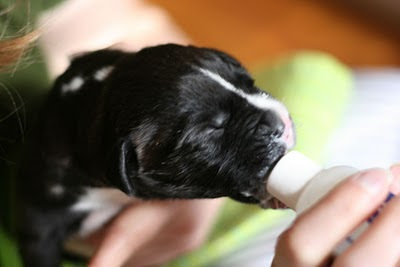 Since then, we've been feeding Wendell (originally dubbed Wheezer due to some respiratory congestion) and Winnie (originally dubbed Whiner because she would not hush her puppy cries) puppy formula mixed with goat's milk from a tiny baby bottle every two or three hours. Yes, even overnight. We're also giving them medicine for their respiratory issues and misting saline solution into their crate/tent/fort with a nebulizer (similar to a humidifier) a few times a day. Winnie and Wendell are sweet, grunty, fat potatoes. Their bellies grow before our eyes. 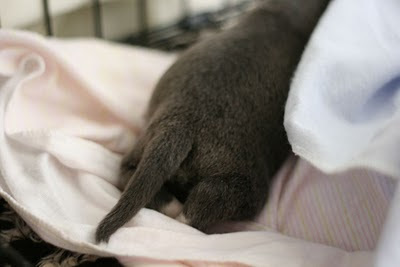 Their little legs are too short for walking, so they drag themselves around a big heating pad in the crate. Their eyes are still closed, but they know when the bottle is ready. They reach their little front legs out and latch onto the bottle. They wiggle their ears and grunt softly as they eat. Wendell even wags his tail. They have round little rumps that are too cute for words! I love watching Chad baby-talk to the pups, swaddle them and feed them. He is the best husband/friend/human being to help me with these puppies. The puppy love totally outweighs sleep deprivation this weekend. 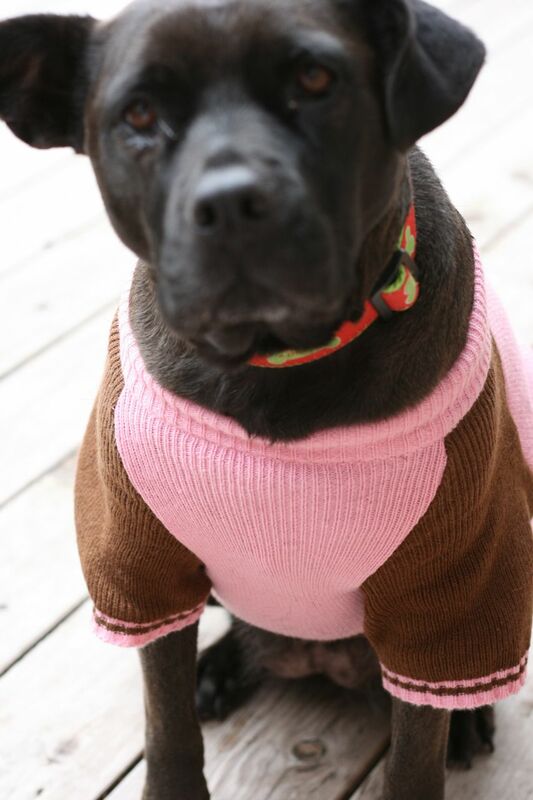 Dress up your pet day is officially celebrated on January 14 each year. 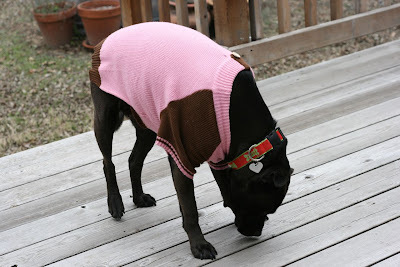 Janie did dress for the day, but I am late showing off her darling new sweater. She also has a pink puffer jacket, but it makes a weird swishy-noise when she walks, so she doesn't like it as well. Also, sweet Janie got into the Christmas spirit last month as she supervised gift-opening. 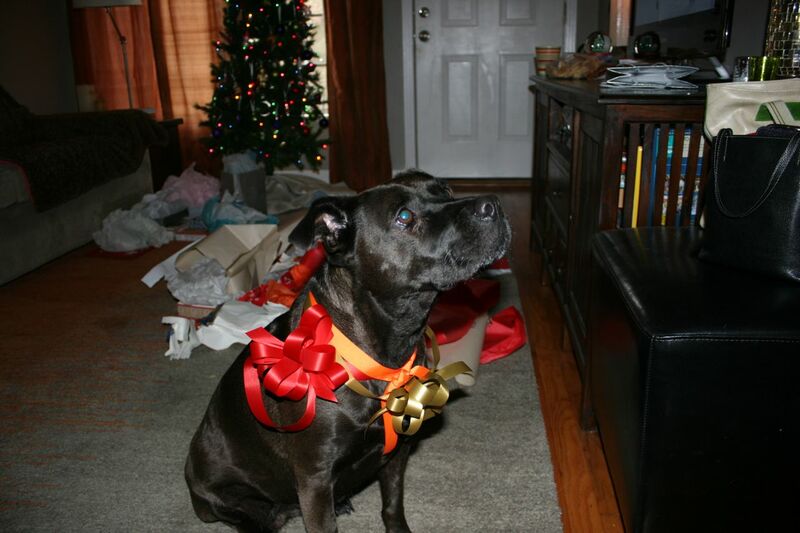 This photo proves that she is the sweetest, most patient and perhaps silliest dog that I know. 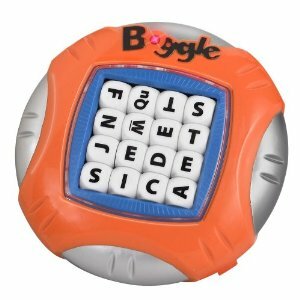 Chad and I play Boggle several times a week. (No, that's not code for anything. I mean the game with the lettered dice. Minds out of the gutters, please.) In the course of finding words, we often consult the dictionary for correct spellings and definitions. One of the many advantages of using an actual printed dictionary versus an online/iPhone dictionary is that one stumbles across the silliest, most charming words in the course of flipping pages. Tonight's delightful find was the word huggermugger which is defined as muddled disorder. Doesn't huggermugger sound much more fun and lyrical than saying "hot mess" or "snafu"? Let's all try to use huggermugger in a sentence this week. Here's an example to get you started: That clearance sale was a huggermugger. Also of note, Chad said if I ever find the word huggermugger on the boggle board (without using any letter twice) that he'll buy an Infiniti vehicle of my choice for me. Blog readers, you are my witnesses! Update: Cooper got adopted! (Not by me and Chad.) I'm so very happy for him! 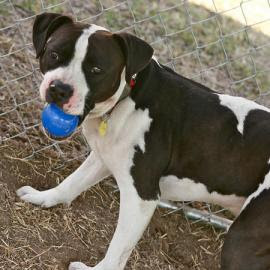 Sweet Cooper escaped from the dog run at Austin Pets Alive. Luckily, he was found and returned within thirty minutes. He wants a forever-home so, so badly. 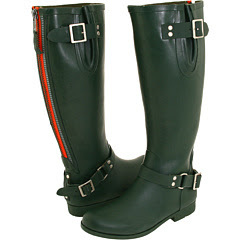 I can wear these awesome boots rain, snow or chilly shine to walk Janie and Cooper. Prepare for the intervention. Someone send out an Evite. I'm free Thursday night this week. Looking over our mortgage receipt for 2010, it occurs to me that little of the money actually went to paying the principal on our home loan. Over half of this year's payments went to mortgage interest. Thankfully, we have a low fixed-rate loan; as opposed to one of those predatory loans that doesn't pay off any principal ever. Just over a quarter of this year's mortgage payments went to paying property taxes. There is no state income tax in Texas, so property taxes are pretty high compared to most other states. Ouch. I love our cozy house. I love that is so close to downtown Austin and all the places we like to go. I love that we don't share any walls, ceilings or floors with other residents. I love that we can have three cats and a dog without a landlord fussing at us, and demanding outrageous pet deposits or pet rent. I love that we've made this house our own with the new driveway, deck, fence, air conditioning system, tankless water heater and decor. I love that this house is small enough to maintain cleanliness, but has plenty of room for us to be comfortable. Do I love the financial reality of mortgage payments and the cost of upkeep on a house? Nope.